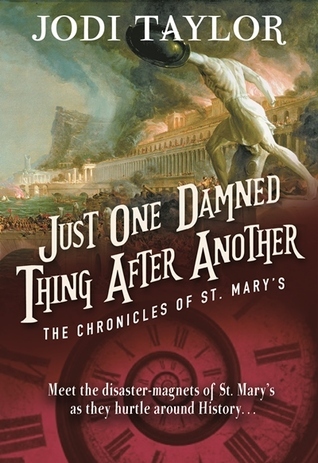 If you read my review of Just One Damned Thing After Another, you are already aware that this book series is currently taking up all of my bookish thoughts and love. Jodi Taylor definitely knows what she is doing! I was a little concerned that the second book wouldn't be as amazing as the first. I mean, how do you top something as amazing as that? Well, she didn't top it. But she did meet its caliber. One of my favorite things about the first book was the excellently accomplished world-building. Taylor did a superb job in this novel as well. I absolutely adored all of the descriptions of scenery both in the different time periods as well as in St. Mary's itself. No matter where she takes her characters, Taylor makes sure that she takes you with them. She makes sure that the world you read about is as real to you as it is to her characters. I love the way she turns this series into a movie in my mind. It's been a long time since I've read one, let alone two, books that are this terrifically descriptive. There were so many times throughout this novel that the relationship between Leon and Max almost killed me. They are so realistic and they share a love that is so believable that their pain and strife is also believable. These two are quickly becoming my all-time favorite couple. I am so in love with this series! Whatever Jodi Taylor does, I have faith in her writing skills. Recently, Melissa from Literary Book Gifts contacted me about their new store. As an Etsy shop owner, I am always interested in discovering new businesses and helping them gain some exposure. As I shopped through the items in the Literary Book Gifts shop, I found myself wishing I could afford to buy more than one item that day. 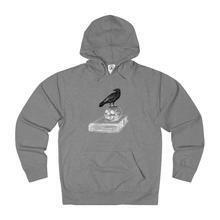 I finally chose an Edgar Allan Poe hoodie which I absolutely adore! The items are good quality. I expected something a little thinner and made of much stiffer material. I was so excited to receive a wonderfully soft and warm sweatshirt. My baby nephew loved it as well and kept curling closer and closer into it. If it's soft enough for a baby to love, it's soft enough for me to brag about. My favorite part about the fabric, however, is that it is definitely made to keep you dry. While walking home from a friend's house, I got caught outside in the sudden downpour of a severe thunderstorm. I was able to walk two blocks before that sweatshirt was soaked through. Their customer service is terrific! Melissa was there to answer all of my questions about sizing, colors, and options throughout the entire ordering process. She was phenomenal to work with! I am so happy to see that her love of literature shines through to her items as well as her customer service. She truly loves what she does and it is obvious! The designs are gorgeous. I love that there are so many options and so many ways that you can truly make your item your own! Go check out the shop. I'll leave a link to it right here! I'll even sweeten the pot for you! Enjoy promo code MSJMENTIONS20 for 20% off of all of your purchases! I have to be honest here, I was a little wary of this book when I first started it. 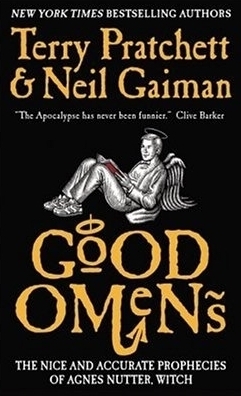 Neil Gaiman is an amazing writer, but I'd never read anything by Terry Pratchett and I was concerned that his writing style would completely destroy Gaiman's. Maybe I'm just crazy, but I didn't want to see Gaiman's wonderful style covered up by someone else. I was so very happy that was not the case. I loved this book! It was absolutely hilarious and most definitely reminded me of something straight from the mind of Douglas Adams. Why shouldn't we have frogs fall from the sky? Why would we want to keep track the Antichrist? All of that would simply make sense in our very nonsensical world! Throughout the entire novel, I was the happiest during the scenes with Crowley and Aziraphale. These two should never have been "friends." Naturally, therefore, they were. Crowley's love of everything fast and furious balances out the large stick that Aziraphale keeps up his rear end. These two are the most un-dynamic duo that ever worked together to fail at the Apocalypse. I specifically loved the precise humor that Crowley brings to the story. Much like any other book that Gaiman puts forth, the world is as realistic as the characters. I absolutely loved the picturesque scenes that the authors created. Each one was so filled with adverbs, adjectives, and prepositions that the world truly came to life before my eyes. If you haven't read anything by either author, I definitely recommend this book as a fantastic place to start. I am going to have such a hard time talking about this book and not sounding like a raging fan girl! UGH I'm going to try my best but OH MY GOD! I love this book so freaking much! I am so in love with this book!!!!!!!!!!!!!!!!!!!!!!! The best place to start, of course, is to talk about the characters. Max is a wonderful protagonist who deserves all the praise we could possibly proffer. I couldn't help but identify with her as she's a short, chunky, red head who always finds herself in the middle of whatever trouble is brewing. That's also a fairly decent description of me. She is such a believable character that the pain she feels forces the reader to not only empathize with her, but actually cringe. At one point, the pain she went through was so powerful that I threw the book down on the couch and screamed. I had no other choice. Maybe I'm just a bit melodramatic, but I think that screams volumes about the kind of reader Taylor truly is. Despite my identification with Max, Chief is definitely my favorite character. He has been through so much in different time periods yet he continues to be a wonderful example of a perfect gentleman. The poor guy has no choice but to go along with all of Max's shenanigans. This could either cause him a huge amount of trouble, or he could simply accept the crazy and just keep going. I'm proud to report that I love when he does the latter. Taylor truly had to do her best work when it came to world building in this novel. Because the characters visit so many other time periods, Taylor is faced with the unique challenge of describing each time period as they get to it. 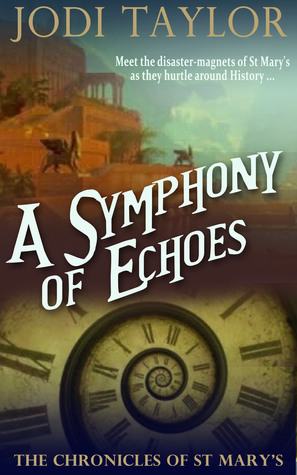 She does a beautiful job of describing the scenery and history of each time as well as bringing in characters from each era that the reader easily relates to and wants the best for. Additionally, Taylor makes the wise choice of spending the vast majority of her efforts on building the personality of St. Mary's University. She explains not only the smells and sights, but the ways that the different characters fit together like one enormous mismatched puzzle. These characters are wacky and mischievous, but absolutely cohesive. Taylor has definitely made her way to my "Favorite Authors" List as a result of this novel. I look forward to sharing my reviews of the rest of the series with you. So begins a curious and mysterious adventure deep beneath the streets of London, a London of shadows where the tube cry of 'Mind the Gap' takes on new meaning; for the inhabitants of this murky domain are those who have fallen through the gaps in society, the dispossessed, the homeless. Here Richard meets the Earl of Earl’s Court, Old Bailey and Hammersmith, faces a life-threatening ordeal at the hands of the Black Friars, comes face to face with Great Beast of London, and encounters an Angel. Called Islington. I have never looked forward to listening to audibooks. I simply have neither the patience nor the attention span for them. When I saw that this version of Neverwhere had been released, I simply had to give it a shot. I first tried listening to it in 2013 when it originally aired. Despite my love for the novel, I fell asleep. I tried again in 2017, but failed again. 2018 led to me spending hours upon hours in the car with several road trips each month. Music started to get a little boring because almost EVERYTHING was overplayed. I decided to give audiobooks another shot. I am so glad that I did! Not only did I finish Neverwhere, I began listening to more audibooks and am now able to enjoy so many more books! All thanks to a lot of quiet hours on the road with my dog. And, by the way, Rascal enjoys listening to audibooks too. I can see his ears perk up when I hit play. 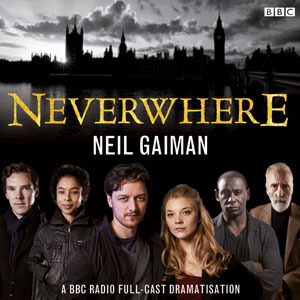 When I started listening to Neverwhere, I was already familiar with the story. It's one of Neil Gaiman's most wonderful works! BBC did an amazing job bringing it to life. I was so impressed by not only the voice actors, but the sound effects. Instead of merely having the story read to me, I was immediately immersed in the action. I was there. I was surrounded by the battles and deaths and betrayal. BBC chose the best actors for this piece! James McAvoy plays a wonderful Richard Mayhew. He simply has the clueless and lackluster voice needed to play an ordinary man in extraordinary situations. Likewise, Benedict Cumberbatch's solemn and menacing voice brings Islington to life. I will definitely be on the lookout for more BBC productions. While I could happily spend this entire review discussing just how amazing it was to listen to BBC bring this novel to life, I believe it's imperative that we talk about the novel itself. To begin, let's talk about some of the amazing characters. By far, my favorite is Door. I admire her independence and quick thinking. She is a truly empathetic character who looks out for the best result for everyone around her despite having necessary tasks to complete for herself. Such a strong woman deserves to be admired! But then, there's Hunter. What a terrific foil to Door! Her physical strength and looming presence terrify others and create a legacy for her, but she is more likely to turn a friend to a foe than help another person. She cares only for herself until the very end. In her last moments, however, I don't believe that she truly redeems herself even though she tries to do exactly that. This BBC Dramatisation brings Gaiman's skill as a master world builder to life. London Above and London Below are very diverse places with very different players. This dramatisation demonstrates and exaggerates these differences so that the casual listener can enjoy them as well. This is true down to the diction of people from both places. For example, the people from London Below tend to be more comical and they enjoy life. Those from London Above, on the other hand, take life far too seriously. Perhaps this is because those of London Below are far too aware of just how short life is. They want to make the absolute most of it while the people of London Above are more interested in living the way they are told to. I truly hope that BBC releases more Neil Gaiman Dramatisations.